GoFormz provides a number of tools to make it easier to find the form(s) that you are looking for. These include filtering by form status, form tag, and form owner; searching by keyword; and sorting by various form attributes. Different tools are available in the web interface as compared to the mobile app, so we go over the two separately below. In the web interface, navigate to the Forms Tab, which contains a list of all forms available to you. There are many different ways to filter this list. In the example above, the list is filtered by tag (Casa Palmera Care Center), owner (Jane Doe), form name (only forms with the substring “work order”), date (5/1/2016-5/31/2016), and form status (Draft). You can see this by looking at the Filters Applied area above the forms list, which lists all active filters. It is also sorted by the Last Updated column in descending time order — you can see this from the down arrow next to the Last Updated column name. All this filtering narrows down the entire forms list to just two forms, showing the power of filters in helping you find exactly the forms that you need. In the remainder of this section, we review how to apply the various sorts, searches and filters shown in this example — as well as how to clear your filters to go back to the full unfiltered forms list. You can sort the forms list by the Form Name or Last Updated columns. To do so, simply click on those column headers. The Form Name column will sort alphabetically, and the Last Updated column will sort in time order. Clicking the column header a second time will toggle between sorting in ascending and descending order. To find forms by name, use the search bar at the top. Enter your search term and hit [Enter] to see all forms that contain your search term in their name. Filter by time range using the Time Range dropdown in the header. 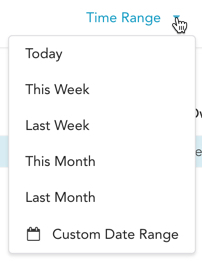 This dropdown contains several canned date range options, as well as a Custom Date Range option which pops up a calendar and lets you select your own start and end dates. Once you make a selection, the forms list will update to show only forms that were last updated within the specified date range. All other filter operations are done using the funnel-shaped Filter button. Click this button to bring up the filter area shown below. To filter by Form Status, click All, Draft or Completed. This will display all forms, Draft forms only or Completed forms only, respectively. 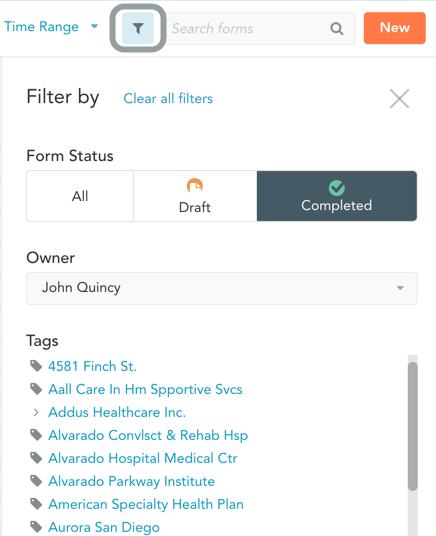 Forms labeled as Shared in the mobile app will appear with the Draft filter here. To filter by Owner, click the textbox under Owner to see a dropdown containing all users and groups in your organization’s GoFormz account. Select an owner from the dropdown, or start typing the owner’s name to filter the dropdown. To filter by Tags, just click the tag name. You can only filter on one tag at a time — you cannot select multiple tags. Your filters will apply dynamically as you click them. Use the Filters Applied section above the forms list to clear your filters. To clear all filters that are currently applied to your forms list, click the Clear All button. To clear an individual filter, mouse over that filter and click it. Both methods are highlighted below. For a detailed review of how to search and filter your forms in the mobile app running on your specific mobile platform, refer to our Mobile App User Guide. Below is a brief summary. To view forms by form status, use the blue Draft, Completed, and Shared buttons along the top of the forms list. Shared forms are drafts that have been shared to a user group, but no individual in the group has claimed ownership. To search on form name, click the Magnifying Glass icon at the top, enter your search term in the field that appears, and tap Search. You will see a list of all forms that contain your search term in their name. Click on a form name to open it, or click the X icon in the search field to dismiss the search. To sort your forms by Name or Date, click the Sort icon at the top, then select how you want to sort (by Name or by Last Modified date). Note: The search and filter tools in the mobile app are not as advanced as those in the web interface, because the primary purpose of the mobile app is to fill out forms — not to search and review them.